Mick Mulvaney may be getting sued over his appointment to serve as interim director of the Consumer Financial Protection Bureau, but he certainly is not letting it faze him. The Office of Management and Budget Office director told CFPB staffers Monday to ignore communications from Leandra English, who was named by former CFPB Director Richard Cordray as his replacement. 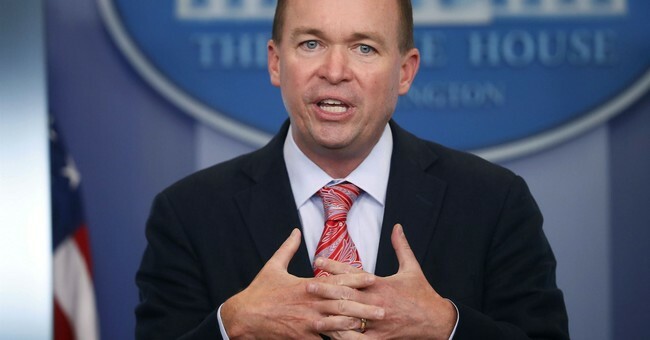 English filed a lawsuit against President Trump’s appointment of Mulvaney as acting head of the agency, saying he does not have the authority due to provisions in the Dodd Frank Act that delineate the line of succession. The administration on the other hand believes Trump’s authority comes from the Federal Vacancies Act—an opinion the Justice Department agrees with. The whole situation is making for a rather awkward environment at the agency, with English sending staffers a welcome back from the holiday email Monday morning, signing the email “acting director” while Mulvaney brought donuts to work. He also told staffers they should not listen to English. White House Press Secretary Sarah Huckabee Sanders said there ought to be no confusion over Trump's authority to appoint Mulvaney as acting head. "The law is clear," she told CNN. "Director Mulvaney is the Acting Director of the CFPB. Now that the CFPB's own General Counsel - who was hired under Richard Cordray - has notified the Bureau's leadership that she agrees with the Administration's and DOJ's reading of the law, there should be no question that Director Mulvaney is the Acting Director. It is unfortunate that Mr. Cordray decided to put his political ambition above the interests of consumers with this stunt. Director Mulvaney will bring a more serious and professional approach to running the CFPB."